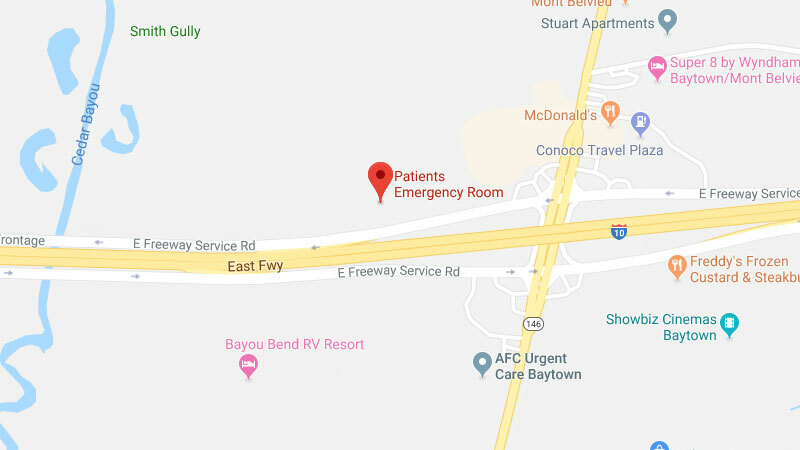 Our facility is located at the corner of I-10 and Hwy 146 on the Feeder Road next to the Shell gas station, which allows easy on-off access to our emergency room along with ample parking next to our front door. Patients Emergency Room is a freestanding, full-service emergency department open 24/7 to treat all of your emergencies without the wait. Our board-certified ER physicians provide medical services to Baytown, Mont Belvieu, Highlands, Anahuac, Dayton and surrounding areas in Chambers County.